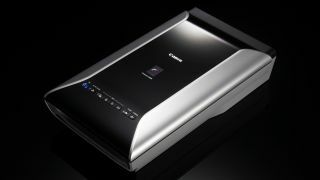 Canon has launched a new high-end scanner, which is also capable of scanning analogue film. The CanoScan 9000F Mark II comes complete with My Image Garden software which allows for quick navigation between the different scanning functions, and includes photo organising capabilities, such as face recognition. A CCD sensor is included, giving the CanoScan a maximum optical scanning resolution of 9600 x 9600 dpi for film, and 4800 x 4800 for flatbed scanning. Canon claims that the scanner is capable of capturing exceptional detail from both photos and film. For film users, the CanoScan 9000F Mark II is capable of scanning up to 12 35mm film strips or four mounted slides in a single operation and also supports the 120 film format. Film Automatic Retouching Enhancement is included to help with originals suffering from dust, scratches, fading or requiring backlight correction. A number of easy to use buttons are included for one-touch operation, while other features include auto power off and scanning to cloud services such as Dropbox and Evernote. The CanoScan 9000F price will be £219/$332 and will be available from April.